TVS just launched their new scooter - Jupiter, a 110cc scooter which is claimed to be most powerful of power, mileage and comfort and an amazing performance. The TVS Jupiter is claimed to be the fastest and most frugal offering in the segment, returning a claimed mileage of 62 km/l. The Jupiter gets a pass light switch and the 110cc engine has been re-worked and has a higher compression. The V-matic transmission has also been tweaked. TVS Jupiter gets the 110cc motor which currently does the duty on Wego and does a sprint of 0-60 Kmph in just 7.2 seconds. The motor produces 8 BHP of power at 7500 RPM and 8 Nm of torque at 5500 RPM. The scooter comes with TVS patented technology like Econometer (Eco Mode and Power Mode). The TVS Jupiter boasts of 17-litre under seat storage (can fit a full sized helmet) and the fuel tank capacity is 5.3-litre which can be filled via an external fuel lid placed right above the rear tail light. The company claims the TVS Jupiter has the largest leg space in its segment and there is an under-seat mobile charger provision as well. There are retractable front and under-seat bag hooks. 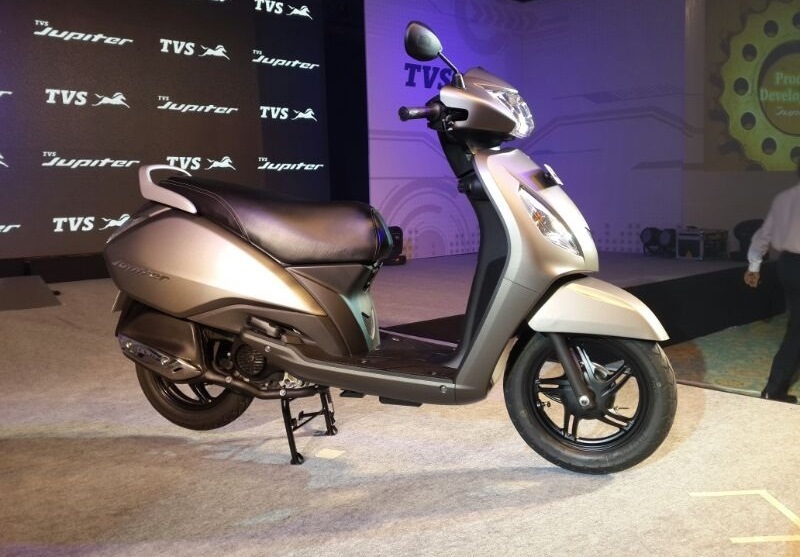 TVS has loaded the Jupiter scooter and it comes with telescopic front forks, gas charged rear suspension, LED tail light and low fuel indicator. One can kick start while sitting. The TVS Jupiter is offered in four colours – white, red, grey and matte black. The automaker will launch a new bike every quarter. Currently TVS is selling 35,000 scooters every month but aims to sell 50,000 units a month by the end of the year. The stylish new scooter from TVS is available in 4 new exciting colors of Pristine White, Midnight Black, Titanium Grey and Volcano Red. These colors look excellent on the new Jupiter scooter.